Hana Herbs and Flowers is a family owned and operated farm located in Hana on the island of Maui. They grow 100% certified organic herbs and tropical flowers. They are also certified wildcrafters. 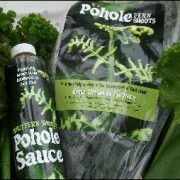 They are a prominent supplier of native Pohole (Maui grown fern shoots), delivering by mail to restaurants and homes throughout the state.